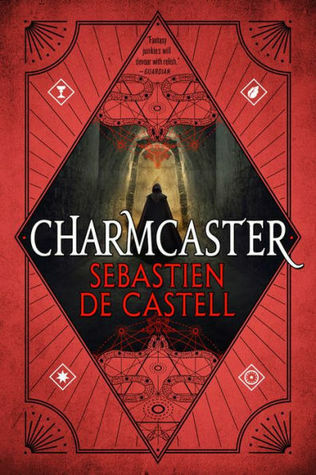 All told, every step of this journey has been great so far, and even though Charmcaster didn’t quite command my attention the way Spellslinger and Shadowblack did, I felt the book’s strengths came through in different ways. I can’t wait to see what’s next. Well hopefully, since there are 3 more books in the series, he’ll start shaking things up. Six books is probably hard to sustain that feeling from the first book. I think so too, and considering the episodic format, maybe he’s just holding some ideas for later. I want to read this series just because the covers and titles! 🙂 Glad you are enjoying this series! I’m seeing this book everywhere. Must be a sign that I need to start this series. Me too, but I’m confident it will! Harry Potter was what came to my mind as well as I was writing that bit! I think by the end, we’ll see lots of changes to Kellen. LOL, it’s rare that I catch up! I’m delighted that you enjoyed this one, Mogsy! A lovely review:). I’m looking forward to tucking into this one during the coming week. Glad you had fun with this one! I want to read this series but have so much other stuff to get through first. Maybe it’s because I read them so close to each other. The similarities just jumped out at me. I liked a lot greatcoats. And I’l curious about this new serie, Spellsinger. Yes, Greatcoats was amazing! This one is great too, and I like that it is also lighter and easier to get into. I’ve just skimmed this because I’d like to pick it up very soon. Good to see you’re still enjoying and I like the idea that this is becoming a bit darker as the characters grow – I guess they’re experiencing things that would certainly have that effect. I’m sure you’ll love this one, Lynn! Hope you enjoy it!